minipost-[Translation] The Chairman’s Clothes Can Not Be Patched? A day in the Summer of 1963, I went to Zhongnanhai’s laundry to fetch the Chairman’s clothes. The comrad at the laundry said the Chairman’s pajama is too old, can’t be washed, and is it time for new one? Few days later, I was eating with the Chairman. He was wearing the very pajama. “Chairman, you and I are different.” I explained. 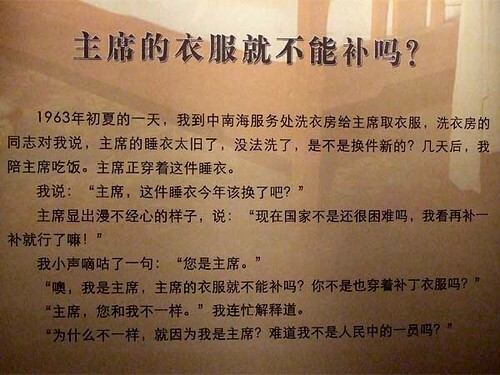 Bai Yansong (here’s his biography), the famed CCTV anchor, was on a trip to film his travels and observations in the US, when he gave this following speech at Yale University recently. (Here is the original.) It has a “commencement speech” style to it and is of general interest. Here is a translation for your consumption. Overshadowed by the Olympics, the news of the passing away of a former supreme leader of China, Hua Guofeng 华国锋, on August 20, 2008 wasn’t particularly noticed by many. I would like to use this post to pay respect to Chairman Hua, as he was once called when I was in my childhood, and offer condolences to his family and friends. This belongs to the “random musing” category. What’s your take? In some quarters, the Beijing Olympics were compared to the 1936 Berlin Olympics. During the debates of that IMHO ill-conceived moniker “Genocide Olympics”, Jesse Owens’ name was often used. A dominant narrative was that in 1936 the more progressive United States, sent in some black athletes such as Jesse Owens to the Nazi Germany. The fantastic performance of Jesse Owens gave a black eye to Hitler. Owens was cheered enthusiastically by 110,000 people in Berlin’s Olympic Stadium and later ordinary Germans sought his autograph when they saw him in the streets. Owens was allowed to travel with and stay in the same hotels as whites, an irony at the time given that blacks in the United States were denied equal rights. After a New York ticker-tape parade in his honor, Owens had to ride the freight elevator to attend his own reception at the Waldorf-Astoria. The LA Times follows in the footsteps of the New York Times in publishing an article discussing Chinese nationalism. See the LA Times article here , and previous NY Times editorial here. These articles do insert some much-needed balance into the Western understanding of Chinese nationalism. The LA Times article is especially notable for offering a view that most Chinese would agree is mostly balanced. However, even in the excellent LA Times article, it seems the journalist buys into a persistent Western myth. Myth: Chinese nationalism was recently created by the Communist Party.